THE HEALTH benefits of walking have been documented thoroughly, but I’ll go even further and offer this bold scientific claim: People who get around on foot often develop superpowers. They become preternaturally observant and notice nuances about their surroundings that are invisible to others. They experience magical moments, such as a red-tailed hawk soaring overhead, that are imperceptible to those of us who view our city mostly through our windshields. However, those who possess this walking-induced superpower also detect less pleasing details. Stacey Fuller and Jenna Bower certainly did. They saw a lot of trash. Bower, a self-proclaimed introvert, and Fuller, who declares herself an extrovert, combined their superpowers last fall to become superheroes. 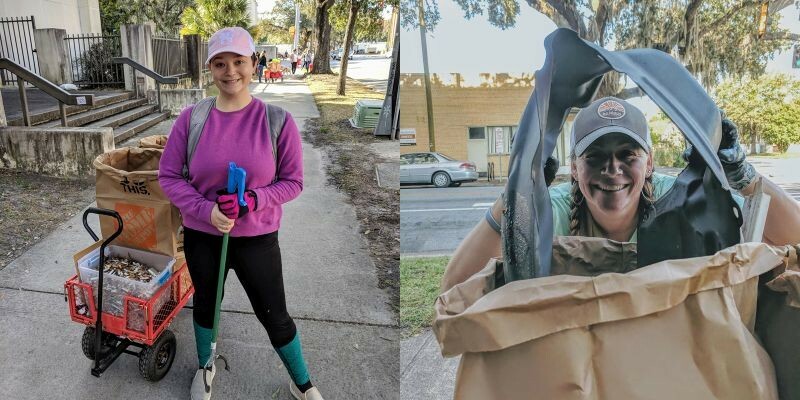 On Saturday mornings they lead the Savannah Trash Warriors into battle against litter. With buckets, bags, and grabbers, they and their fellow volunteers deploy to parts of the city each week. Jenna Bower and Stacey Fuller. “We had a passion to get out of our own neighborhoods and explore other spots around town while trying to be inclusive to which types of neighborhoods we visited, so we essentially pulled up a Google map and tried to schedule cleanups in as many neighborhoods as possible,” Fuller said. However, they are careful not to intrude in a neighborhood that “hasn’t explicitly welcomed us or partnered with us, because we don’t want to interrupt what neighborhoods are already doing,” she said. They experimented with different methods of selecting trash pick-up sites and collaborated with neighborhood associations. Early this year the duo began to see dynamic results. “When new Warriors came to our cleanups we started to say, ‘You came to my neighborhood and helped me this weekend, we’re going to come support you next weekend,’ and it’s really grown from there,” Fuller said. 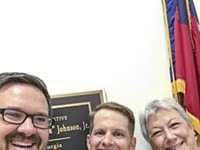 By providing a way for volunteers to develop their own superpowers, Bower and Fuller are also helping them develop stronger connections to their community and to each other. Giving residents a glimpse of what our streets look like up close also makes them more attentive to and protective of the things they love about Savannah. “We think getting people outside, on the street level, interacting with their environment does make a difference, not only in exposure to the amount of trash, but the beauty of the city and why it is important to preserve it,” Bower said. 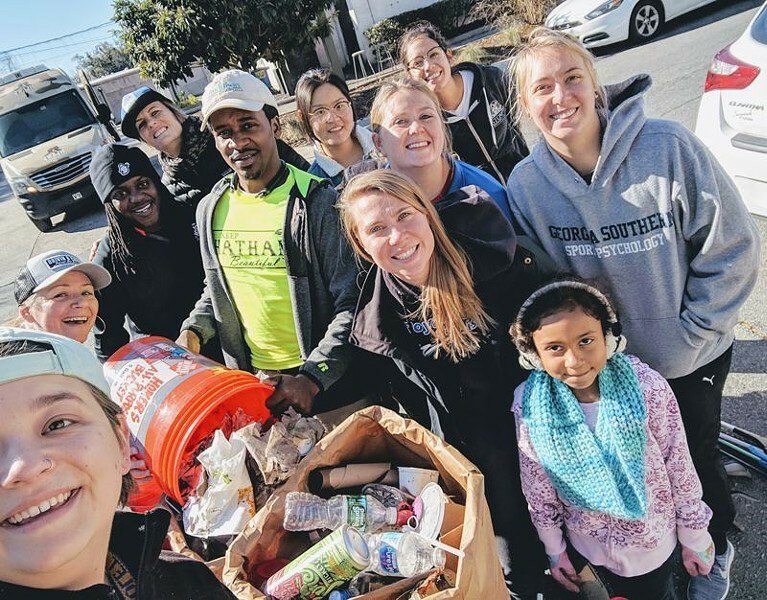 The Savannah Trash Warriors are among a growing number of people-powered efforts aimed at improving the public realm in Savannah. Last May Thomas Square Historic Neighborhood Association President Clinton Edminster organized a tactical urbanism demonstration in the Starland District that included temporary crosswalks, improvised street furniture, and signage aimed at showing how the neighborhood’s public spaces could be made safer and more appealing. Ardsley Park residents took to the streets of their neighborhood last fall to undertake a comprehensive evaluation of the condition of sidewalks and other infrastructure, and identify opportunities for improvement through the “Ardsley in Motion” project, led by Nick Palumbo, who was then president of the Ardsley Park/Chatham Crescent Neighborhood Association. 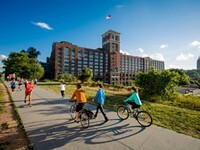 Both efforts received technical assistance from Bike Walk Savannah and Georgia Bikes. Bower and Fuller understand that picking up litter addresses the symptom but not the core problem. Behavior modification is essential for reducing litter, but Bower and Fuller are going deeper. Note to readers: I wrote the first News Cycle Column in May 2011. 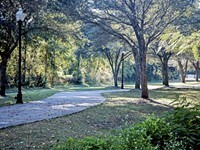 At the time I was a board member of the Savannah Bicycle Campaign, now Bike Walk Savannah. After nearly six years as executive director, I am stepping down from the position. Caila Brown has been named interim executive director. I will continue writing the News Cycle and serving on the BWS board.